Regular human-sized, though a tall human. Nice paint job, with lips, eyes, etc. A little too much bare skin for a typical adventurer, but she makes a fantastic pirate or similar NPC. I have many female players in the various RPGs that i run, and it is usually very disappointing for them when they try to find a good mini to represent their PC. This mini is excellent. A good sculpt with just enough details to be interesting but not so much that it limits the versatility. This mini could be used as a pirate, obviously, or a fighter or even a thief. The fact that is gives my female players another option for their PC is icing on the cake. 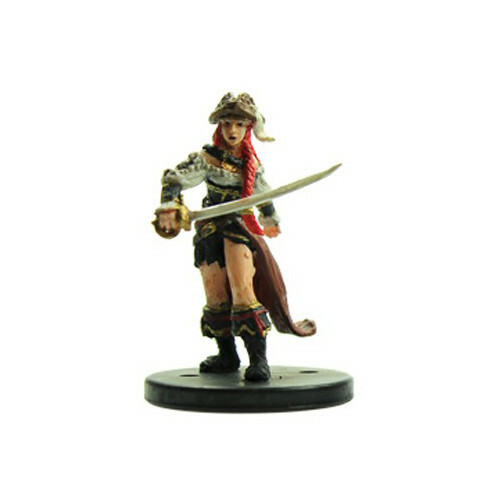 The figure is in an action pose looking like she is either about to block at attack or is contemplating running some scurvy landlubber through with her cutlass. Like most of the figures in this line it is very sturdy with good vibrant colors. her cutlass was bent slightly in when i got it, but this was easy to fix. Sadly the price is a little steep, but if worth it if you run a lot of pirate campaigns with female PCs or NPCs.